Click here to see the official notice of CID West Bengal Recruitment. Last date to submit applications: 09- 06-2017. 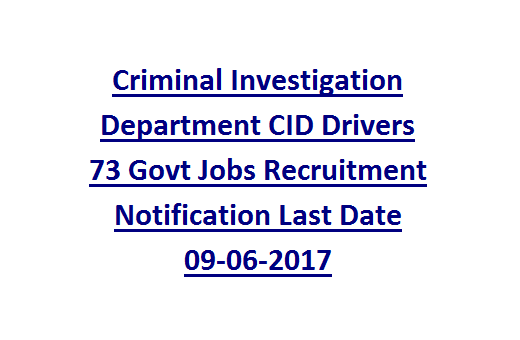 Selected candidates for the posts CID Driver will be paid Rs. 11,500/- per month plus other allowances as per Govt norms. Board having knowledge in reading/ writing Bengali. See the CID WB Notification for more details. See the Notification for Age relaxations details. based on their performance in Driving Test, Medical Test, Interview. called to attend Driving test and Medical test. application at the time of Interview. Please go through the notification for more details. date to send application form is on or before 09-06-2017. Application should be in a plain paper. West Bengal Bhabani Bhaban, Kolkata- 700027.